A pulpy homage to serials that frustratingly can’t capture the adventure which it’s so enamoured by. Sky Captain throws endless fun elements such as giant retro 30’s imagined robots, ray guns and a P-40 War Hawk aeroplane at us with such joyful abandon that I should be on board and loving it from the get go. Unfortunately this wasn’t the case and I blame the film’s script. It certainly isn’t due to a lack of love put into the film; without knowing about the years of work put in by director/writer Kerry Conran, you can still tell through watching the beautiful, almost entirely green-screened environment, that the film was a real labour of love. I’m a bit of a sucker for the art deco stylisation of the film, and with its soft and muted feel, as well as the hand-drawn quality to several shots, it’s suggestive of having been filmed within a living breathing comic book. The result is pretty gorgeous but does tend to lose its power further into the film and is certainly not for everyone. 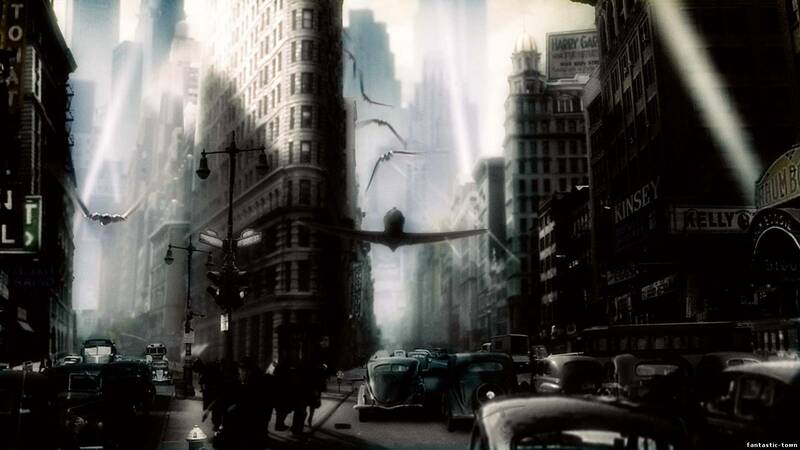 Originally it was intended to be presented in black and white but Conran was denied this option both on the cinematic release and as an additional option on the DVD. If you have the chance it is interesting to set the gradient on your TV right down, reducing it to B&W for an alternate, arguably better experience. Another highlight would be the pop culture references which are strewn throughout the film. Both subtle and obvious they range from King Kong to Star Wars, Metropolis to Titanic, and help to considerably up the re-watch factor as a film fan can’t help but keep an eye out for them. For a film which is meant as nothing but wall to wall fun, it soon becomes obvious that one of its most glaring problems is that it just isn’t fun enough. Sure it throws in loads of fun ideas and references, and is more than happy to abandon logic in order to serve a cool idea, which is nice to see occasionally in a film if it’s approached, as this one is, with the right attitude, but ultimately the script lets it down. Attempting to straddle a fine line between being something new and interesting, whilst also staying strongly reminiscent of the films it’s emulating, it often falls into unoriginality and dullness – which is crazy considering how well some parts of the film succeed at hitting that balance right. It’s as if they were having such a good time throwing in all the extra bits and pieces, fun references etc that they forgot to actually make a good film with a well written story and good dialogue. You know you don’t have to write an amazing story for this kind of film, just one which is simple and makes sense, which is something that this film tries to do but it just winds up convoluted. The cast assembled is decent; it’s billed as being led by Jude Law, Gwyneth Paltrow and Angelina Jolie, despite rather differing levels of screen time. Paltrow and Law are OK, trying to screwball through the film they wind up bickering instead due to the dialogue they had been presented with. Angelina Jolie seems to be having a lot of fun with her role, which is maybe why her ten minutes are a particular highlight. Undoubtedly underused, she still manages to leave an impression and that’s not just because of her resemblance to a certain pop culture figure. I reckon her character could strongly feature in a spin off/ prequel concentrated on Sky Captain serving as the roguish outsider to her and her squadron – sort of a version of Han Solo and the rebel fleet. Now that would be pretty great but this film’s reputation and box office sales pretty much determine that such a film will never get made. It was originally conceived to be presented as an original serial film that had been lost within the vaults of time; it would have featured several distinguishing characteristics such as chapter cards and unknown actors and it’s a shame that along the way it has lost several of those concepts, no doubt it would’ve helped increase this film’s originality. Still let’s not kid ourselves, even if it had kept them its script would still succeed at making this feel generic and a little dull at times. The glee with which this film is approached is a real positive however and is key to the film retaining what memorable quality it has, but I can’t not mention the other great thing about this film which is its soundtrack; seriously it’s good enough to evoke classic scores such as Indiana Jones’s and Jurassic Park‘s and I think it’s a fantastic piece of work. If you have seven minutes to spare, stick this on (here), it’s an assembled collection of the film’s score and demonstrates just how great it is. Everything the film should have been is contained in this track. What is the film’s greatest strength? The film’s approach and evident real love for its subject matter. Its greatest weakness? The script, particularly the relationship between Law and Paltrow. I’m also not a big fan of how it resurrects a certain dead actor. Would I see it again? This film has so many great elements that it hurts that it didn’t come together; instead ending up frustratingly mediocre and deserving of better. I however do really enjoy it and have seen it several times. Tap out your thoughts in the comment box below! Note: This is a tweaked version of a review written two years ago. I’ve revamped it as I wanted to bring the film a little more attention on my blog as it’s often forgotten, and I think makes for an interesting film to discuss. The original review can be found here. Hi James! Someone just mentioned about this movie on my blog. It’s been ages since I saw it but I remember liking the visuals. I think the script is quite weak, as I barely remember the story! Haha yeah that’s not a bad way of testing the script! The visuals are nice, and I do like a lot of other things about the film but it is unfortunately a flawed one. Great review, man! I was very curious about this one when it came out, but then it fell of my radar and never got to see it. I shall give it a chance but with lowered expectations. If anything, it’s a visual treat, huh? Cheers buddy! It’s been a while since I last spoke to you, how are you? Yeah go in with lowered expectations and you should enjoy it, or at least the parts of it that worked best. It is if the style works for you. Within the first five minutes or so you’ll have a good idea if you’re going to get on with the style or not. I’m great, thanks! How are you? Yeah, the style is what got my attention in the first place and that’s what’ll get me to watch it after all these years, I think. Good. Not bad thank you! Busy, but that’s not a bad thing! Cool, well you’ll have to let me know what you think if you do see it. I wish there was a whole lot more of Jolie in here, she knows exactly how to play her role in this sort of film. And yes. I’ll definitely let you know when I see it. And funny, judging from the marketing, I would’ve guessed Jolie played a bigger role. And yeah, I don’t consider it to be a spoiler to tell people how little she is in it! On the contrary, it’s necessary and useful info! I’m glad to hear it! I’m always cautious of what I’m writing with that Spoiler Free tag I put on my reviews! Ah there’s nothing worse than a film with lots of potential failing to live up to its promise. Still, I reckon it’s a good one to stick on when you just want to watch something that looks great – I certainly like the idea of World War II Steampunk! There really isn’t, except ones like this one where they actually come frustratingly close! Yeah exactly! 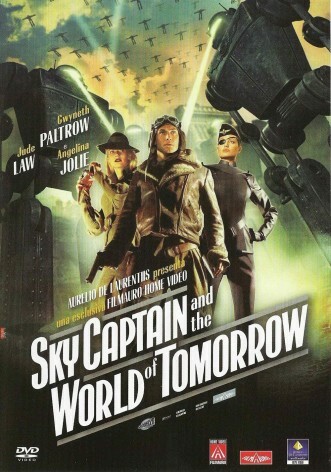 WWII Steampunk with pulpy robots and Angelina Jolie as a (Minor Spoilers) Nick Fury style character! What’s not to like?